Mai sent us an interesting article on Huffington Post which I’m going to paste below to eliminate all the streaming popups such as gov’t subsidized Newsy trying to drown out & contradict the article. I will also include the article link below. The one thing they are wrong about is where the melting ice has caused the axis shift. It is the south pole ice which balances the axis, not the northern hemisphere ice. The more the south pole ice melts, the more the axis shifts. The south pole ice weight acts like an anchor point on a Gyroscope; balancing earth in space as it orbits the sun. As the Antarctic ice melts, the axis tilt shifts further, allowing earth to increase the tilt angle & lean more. This affects our weather & Seasons. The second error is the confusion between the true north axis & magnetic north. These are entirely two different issues. The axis is the center point of rotation not associated with magnetic north. Any planet which rotates has an axis but not all planets have a magnetic field. A magnetic field is produced by the iron content in the earths molten core. Much like an electro magnet has an iron core wrapped in a copper coil. However, as our tilt shifts, the molten iron core of the earth which produces the magnetic field also shifts inside the earth. It is like filling a rubber ball with pudding. As you turn the rubber ball, the pudding inside also moves. So when the axis tilt shifts, the molten core moves as well. This causes the magnetic north location to move position and change shape & intensity. Magnetic north position changes are the result of the axis slippage… not the cause. I discovered this axis change problem in the summer of 2005 and began posting info on another website. I then started this blog site back in 2006. I was the only one identifying this axis shift problem at the time. Every other scientist denied it. Now we have JPL, NASA & other scientists taking the credit for discovering the axis shifting which they had denied existed for over 10 years. At least they now realize the axis is shifting so that’s a start. It is important to show mainstream scientists are finally catching up. This is a real issue. The reversion bought us more time on the axis shifting, but now that it is shifting again, it will soon return to a critical point. Probably in the next 10 years. However, the gov’t always minimizes the actual disaster in their reports & statements by reducing hundreds of miles into inches or a 9.0 quake to 6.9 to give everyone a false sense of safety & security. For example, this is the same way the death tolls of Katrina & 911 WTC deaths were reduced by the gov’t on official reports from 10,000 to 1800 and 50,000 to 2600 respectively. Scientists solve mystery of why the planet’s axis is tilting eastward. The position of Earth’s axis has dramatically shifted, likely because of melting ice sheets (fueled by climate change) and natural changes in water storage on land, according to a new study in the journal Science Advances. Erik Ivins, senior research scientist at NASA’s Jet Propulsion Laboratory and co-author of the study published on Friday, told The Huffington Post that the movement of water on Earth’s surface affects the planet’s distribution of mass — and its axis — much like adding weight to a spinning top. The shifting axis might add to the effects of climate change on our stressed-out planet: Global temperatures are getting hotter. Weather events are becoming more extreme. Sea levels are rising. Earth, as many of us remember from grade school, spins on an axis. This axis is an imaginary line that stretches through the center of the planet from the North Pole to the South Pole, and is tilted at an angle of around 23.5 degrees with respect to the orbital plane that includes the sun and Earth. Scientists have long known that Earth tends to wobble as it spins, causing its poles to drift slightly. However, a dramatic shift occurred around the year 2000, when the North Pole turned east. In an attempt to understand why, Ivins and his colleague Surendra Adhikari analyzed space geodetic and satellite gravimetric data from 2003 to 2015. This data allowed the researchers to unambiguously identify the causal mechanism for the Earth’s drifting poles after 2003. The researchers wrote in their study that the Earth’s spin axis has been shifting 75-degrees eastward from its normal long-term drift direction since the early 2000s. That shift, the researchers found, is being driven not only by melting ice sheets, but also a loss of water mass in Eurasia due to the depletion of aquifers and drought, according to a NASA release. “This is the first time we have solid evidence that changes in land water distribution on a global scale also shift which direction the axis moves to,” Adhikari, lead author of the study, told New Scientist. While the findings are surprising, Ivins said, there is no need for alarm. The shift, he said, is relatively small, and there is no real chance that the amount of solar radiation reaching sensitive parts of Earth will increase. As I’ve mentioned before, the gov’t thinks the economy will implode if the public learns the truth about various global issues and everyone will stop working, buying, paying taxes, etc. The gov’t & corporate moguls want to keep their pockets filled at your expense & keep everyone in the dark just like the old days of serfdom slaves for the rich lords. Remember, they all have their fancy shelters to survive global catastrophes. They will keep the public in the dark & work them until the last minute when the axis shifts the planet onto its side & leave them under martial Law to die without food, infrastructure & protection. Remember Katrina? It was the adjacent states which finally rescued the victims who were starving. Having worked with FEMA, I can guarantee that they have no plans to feed & rescue victims. When I attended the emergency management meetings for one of the largest metros, FEMA nearly tore my head off for asking about food, water & supplies for victims. The 911 center manager was also upset about FEMA taking over the emergency management & the disappearance of the supplies. I suspect the supplies disappeared into the gov’t shelters such as Denver airport. They had no intention of rescuing victims. When Katrina occurred, it was handled exactly like FEMA planned. Control & corralling the victims but no food, water, meds or rescues. The bodies from the airport disappeared into a mass grave. Texas sent buses & set up a victim shelter in the Astrodome. Other states provided homes & shelters as well. The Louisiana governor was not at fault. The moment she signed the request for emergency federal aid, FEMA took over control of the state gov’t and nat’l guard. This is why Florida refused FEMA’s aid a couple months later when another hurricane hit them. Any ads are inserted by WordPress & are not associated with this site nor approved by its owner. Interesting site, thank you for keeping it up. I live on the 45th parallel in the US. I have been watching the sun “go north” more of the year and seeing NNW sunsets thinking I was wrong. So glad to see others have been seeing the same. The thing I noticed first in about 25 years ago was the change in the clouds; 1999 sun smaller & whiter; 2003 chemtrails; approx. 2008 the moon tilted and reflections of the sun from windows changed to an x-shape; also sunrises were almost always obscured and it seemed many times that there were two light sources, then it stopped for a good while and seems to have started up again the last 2 yrs; approx 3 yrs. ago sun on the skin hurt with even very short exposure with some painted surfaces really getting affected. Some time this summer, wish I had written down the date, but was about 3 months ago, there was a fantastic purple sky in the evening. Never seen anything like it my whole life. So this winter, I will be watching to see how far south the sun will go. About the earth shift: if you could, it would be helpful to see even a hand-drawn pic of what you are envisioning as the new position, spin and pole locations of the globe. I have no qualifications whatsoever, so just saying my ideas here. You are basing shift on ice as ballast. To me, ice that is floating is already in the water and, like a glass of water with ice, if it melts, no problem. But you have Greenland and Antartic land-based ice melting; so then it becomes an ocean/landmass thing. Recently saw a pic of what the earth looks like without the oceans. Super lumpy looking with 2 large depressions in the lower pacific. Then we hear that cosmos physicist saying earth is “obloid” having a broader bottom half, top half being smaller, kind of pear-ish. So my take, there is more to factor than just land-ice melting. If earth was without oceans, how would the ball balance then; and would the oceans modify the situation? There are 4 images on this link. The bottom right image shows the final horizontal position of the Earth & the direction of the rotation. I don’t have the tools to animate it. I looked at the images you posted, but I’m still confused. You say that areas closest to the equator after the shift will be the most habitable, but do you mean the current equator or what will be the equator after the pole shift? How will the US fare after the shift? Unfortunately, I don’t have the ability to animate. The equator is the same location regardless of planetary position. Pretend the planet has tipped onto its side and the north pole axis is always pointing at some fixed position to the left as Earth orbits the sun. Always pointing at the same spot while orbiting even though the planet would be laying on its side with the north & south poles horizontal. Continuing to rotate except up & down instead of East & West. Since everything is round, it would still look East to west from our perspective. But viewed from space, the planet would be lying on its side like the 4th image & the north pole would always be pointing to a fixed spot to the left as it orbits the sun. So during the fall & spring seasons, the equator faces the sun. But during winter, the south pole would point directly at the sun 24 hours per day and the north pole would be in total darkness. During Summer, the north pole would point at the sun and the south pole would be in darkness 24 hours per day. It is during these winter & summer months of extreme heat at one pole & extreme cold at the other pole where the equator near Columbia South America or Egypt would be between these two extremes and best for survival. Spring & fall won’t be a problem. I can’t fix the minds ability to picture how the north pole would always point at a fixed position to the left if the planet shifts with the tilt onto its side but that could also vary in the end. It has to do with magnetic orientation. You would have to be able to picture how our planet normally tilts toward a fixed spot as we orbit the sun to create 4 seasons. And how that would be affected if the tilt shifted the earth onto its side horizontally instead of vertically because the poles would both be horizontal. 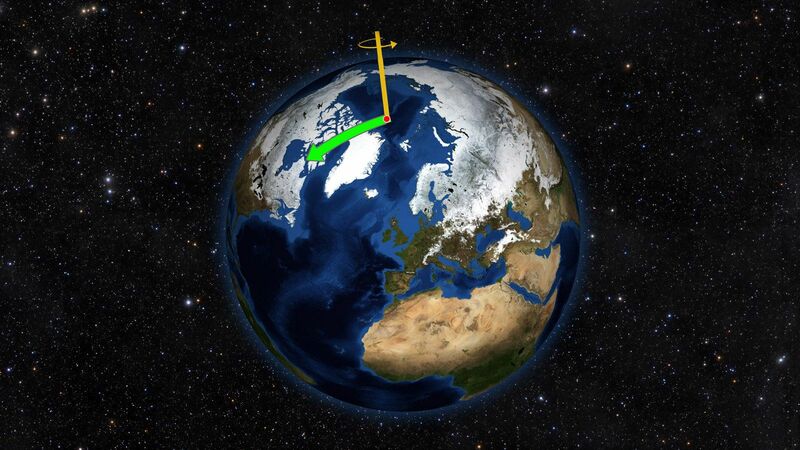 The north pole would always be fixed pointing to the left as earth orbits the sun to create 4 seasons. 2 seasons of which would be extreme cold & dark while the other pole hot & bright. You’ll have to work it out with a rubber ball in the bathtub & Mark the poles & equator with a sun at the center of orbit while the north pole always points toward the faucet after the planet shifts sideways but continues to orbit the sun. With the poles east & west during the fall. West & east during the spring. North pole facing the sun directly in the summer. North pole in total darkness away from the sun in winter. I’m sure there is an animation of how & why the seasons NORMALLY function; online. Then imagine the poles being horizontal instead of vertical as the earth orbits the sun. At some point, I’ll try to create a series of images to show the orientations but I’m not feeling well enough at the moment. We are not in any immediate jeopardy since the shift reverted a couple years ago. So it may not occur in our lifetimes as it was previously going to do. Perhaps our experts were given the means to counteract the situation? Something changed. It still is not normal but it is certainly improved. But if we shift onto our side, there will be global tsunamis 3 miles high like occurred at Puma Punku. Once the water settles & recedes, find some mountain in Central America with a fresh water supply. away from volcanoes. If you sit around wondering why, you may lose your opportunity. Then you may become trapped in the US & will have to live underground during summer & winter & find untainted water, power & grow underground crops for food. Available land at the equator, especially land which can grow crops & offer fresh water, will be at a premium demand. Especially if the global melt increases sea levels by 297 ft. which would leave even less land available. Take a look at the image of Uranus orbiting the sun. Uranus is laying horizontally in the same fashion. See how one pole is in total darkness. This is the best image available. Glad someone else is noticing the clouds. Been taking pictures for over a month now and the morning skies have just been ominous. Been concerned for a while about pole shift too but has anyone considered we are passing through our galactic center? It’s all too big for me to stay too concerned anyway. But things they are a changing. The color change of our trees was 2 months late. One tree, Catalpa which is not native to the region, dropped its leaves without color change. The sweet gum trees should have turned bright colors two months ago. They are just barely beginning to change on the edges. They are still using chemtrails but not daily as they were doing. Maybe once a week. The rains which usually start normally here in mid Sept never came so they are supplementing with chemtrails. The cool weather only began in the past week. So we are 2 months behind on that as well. It will depend on where each person lives & the weather patterns. I believe this winter may be much colder. But that is just a guess. I have heard that theory also. By itself, it can make sense; but with all the rest, like you, I have no idea, I am not that savvy. Especially since I am hearing Earth is now on the Orion arm of the mid-galaxy and not the Sagittarian arm of the edge-galaxy like I grew up being taught. They say this is a Mandela Effect, but considering all the other mis-info, who knows anymore. CERN could be causing all of this due to quantum dimensional or time-like shifts and most would deny it because it would be too much for their psyche to take on. All I can do is watch, because I can’t afford to do anything else. Just know there is tons, tons of stuff happening behind the scenes and we only hear hints from time to time. There are scientific events, political alliance events (public, black ops, global, etc. ), astronomy events and spiritual events all happening at once, that is the thing to know. It’s all going into one big stewpot and when it’s done, it may or may not taste good. I think I can guarantee we are not on orion’s arm. If you can see Orion in the sky from the same perspective, then our solar system hasn’t relocated. Keep in mind, the gov’t hirelings like to fill the internet & media with garbage to confuse the public & distract them. However, Cern does have multiple levels of different cyclotrons & devices. One has to wonder why so many countries contribute such massive amounts of money for a collider which is never in service. There may be multiple cyclotrons positioned globally to correct the axis shift. Something improved the axis angle in 2015. Only half way. It is still shifted nearly 1000 miles off normal. But that is better than the 2000 miles it was off in 2014. They may not be willing to try for total axis correction. Just a possibility. I’m only guessing on this. However, due to the distance of the constellation stars, a 2000 mile axis shift is barely discernible on our star field. This is different than solar system relocation. There is an example of the star maps with a 2000 mile variation on this link below so you can see how similar the stars are 2000 miles further south on the same longitude, date & time. Yes, I see what you are saying. The star pics with the green lines, those remind me of ancient S.A. Native pottery patterns. Maybe that was their way to teach star maps, interesting. However, I am also thinking of how the Inuits are saying they can’t use the stars to navigate correctly anymore. Many are saying how the stars look way too close now. I have no idea, as I seldom go outside at night. Yes, you are very right on the baiters out there; so I had to look up the galaxy arm thing. In Wikipedia under “Earth’s location in the universe” and per the Royal Institution of Great Britain, our solar system is currently traveling through the Orion arm of the Milky Way Galaxy. But there is another category below that called subgroup and Sagittarius is named as one of those. The pics there weren’t specific enough so I went to Hubblesite.org. Here it says: Where is the Earth in the Milky Way galaxy? Our solar system is at the edge of a spiral arm called the Orion Arm, and is about two-thirds of the way from the center of our galaxy to the edge of the starlight. So sounds like we are 2/3 in now instead of out on the edge like we used to be told. And looks like they are starting to integrate the idea of “orion” as where we are now. Couldn’t search on Spaceweather. Ok in Wikipedia finally found something solid under “orion arm”. Maybe they refined the galaxy map or something. Shows we are in the Orion Arm which is between the Perseus Arm and the Sagittarius Arm. Ok, in universe today dot com (where is earth in the milky way?) it further clarifies that Orion Arm is really a spur off of the Sagittarius. So there we go. Looks like the sun takes 250 million years to make a circular route all through the Milky Way and that’s where we are now. Some time in the last 20 years or so they must’ve updated the star maps and I missed out. I had not researched galactic mapping. I was thinking about the constellation rather than the spiral arms. However, if an entire solar system moves within the galaxy, it would definitely affect the star maps as viewed from a planet. Something that would likely occur on a very gradual basis over the millennia. Unlikely to be viewed within a lifetime but easy to see in the constellation proximities if occurring on a more rapid timeline. I would think the process might be similar to a pond with a surface coating of pollen which is slightly rotating on a minuscule basis. However, the gov’t hirelings have been tossing out all kinds of issues to distract attention & deter people from events like the axis position of the sun. Ever since some mainstream scientists began admitting the axis has shifted, the hirelings have been posting scares on asteroids, rogue planets, pole reversals, orbital shifts, system wandering, core changes, magnetic field changes, etc. to confuse everyone enough so they don’t know what to think & just give up. Since most scientists are tied to gov’t grant monies at universities, tax dollars like NASA or dept of Defense contracts, they are pressured to kowtow to gov’t demands, policies & official POV’s. Nearly all of their careers, titles, salarys, etc. are tied to gov’t funding. Very few of us are independent & not subject to pressure. There are a lot of scientists who are in gross error about many things. Magnetic fields, accretion theories, our moon formation, the asteroid belt, the 5th planet, the great flood, the loss of the dinosaurs, Mars, the earth’s core, the axis tilt, etc. I am interested in what you have to say about main things like that. Nothing too complicated as math is not my thing. After realizing most of the things I have been taught are in question, it makes sense to pay attention to new ideas. It helps to connect the dots sometimes. I realize current science is mostly theory anyway. I’ve found an interesting video about a PHYSICIST explaining why the axis is changing. I’m sorry. He is so far out in left field I can’t support his link. He’s also after money. If we were to believe the crust is independently shifting that would be like turning a rubber ball in your hands and saying the exterior surface of the ball is shifting on top of a secondary surface without the rest of the ball. The entire ball is turning as is the entire earth tilting. However, the Earth’s core is molten magma, mostly iron since it is also generating a magnetic field. Volcanoes vent the pressure. But when turning the planet, the molten core moves around similar to placing pudding inside a hollow rubber ball & turning or tilting the ball. However, that guy on your link I removed, is a hireling who makes jokes out of serious issues like Shermer. I promised the truth on this site, so he wont be panhandling his wares & seeking money on here. The gov’t uses hirelings & goofballs to make a joke out of issues they wish to discredit. In the 50’s, they used the nut who claimed to ride around in Venusian crafts to discredit the UFO movement and witnesses. Project Grudge (later Blue Book) was the brainchild of Richard Bissell who was later fired from the CIA along with Allen Dulles & Charles Cabell. These were the men who orchestrated Kennedy’s death & controlled the Warren Commission. Did you know Cabell’s brother Earl was the Mayor of Dallas in 63. Allen Dulles was the CIA director over the MK ultra mind control projects. Remember Sirhan Sirhan’s repetitive writing? Dulles was still controlling these crimes from the periphery. Anyway, the magnetic field has nothing to do with the shifting axis. Some planets have no magnetic fields. However, it protects us from solar flares & ionized radiation, etc. It is the gravitational fields & balances which are affecting us. Our entire planet is shifting like turning a ball in your hand. As the molten core sloshes around inside, it does affect the shape & position of the magnetic field but that is only a minor after effect of the planet shifting. Every time I hear someone say the crust is shifting, I cringe. The crust is no more shifting independently than the skin of a rubber ball as you turn it in your hands. When the crust shifts, it is the movement of tectonic plates like the San Andreas fault in California which 2 plates shift & slide causing quakes. The tilting axis of the earth is quite different. The entire planet is tilting & shifting downward as we lose the gyroscopic balance point of glacial weight at the south pole. I was lazy before & some bad links got on here. (Since removed) Some people actually thought this was his website. So now I check everything. This new link teaches a little on magnetic fields but it is incorrect about how they are generated. There are a lot of scientists who are in gross error about many things. Magnetic fields, accretion theories, our moon formation, the asteroid belt, the 5th planet, the great flood, the loss of the dinosaurs, Mars, the earth’s core, the axis tilt, etc. I could go on and on. I’m fortunate enough to be an engineer & research scientist. Engineers have critical, practical skills the scientists are lacking. However, there are hands on skills most engineers lack. In my case, I also performed the tasks which I engineered. I used to send my engineers out into the field to learn hands on what they were engineering for others. They didn’t like it, but it made them better engineers. I was still climbing ladders & participating in the work when I was a VP. The installers were still quite shocked to see a female VP Engineering & operations climbing on top of the equipment & cabling. But they respected me because I knew the work first hand. After that, I went into science research & various fields. The quality of engineering & science went downhill after I retired fairly young at 47. I couldn’t bear the drop in skill sets. The new engineers & scientists were clueless & lacked any desire to learn. The newer engineers & scientists refused to learn the skills & knowledge we had spent 100 years developing. They decided they didn’t need grounding & lightning protection to safeguard circuits & multimillion dollar equipment. Or safety systems to keep our rockets, satellites, communications & EM shielding functioning. They skipped all the protection to save money because they decided it wasn’t needed. One such result had the $200,000 system circuit packs failing 2-6 times every week without a proper grounding system. Companies had laid off their experts for cheap newbie engineers fresh out of school with no experience & hired 35 year old CEO’s to make dumb decisions. I was recalled from retirement to fix the systems which decreased from 6 failures per week to 2 per year. Much cheaper at $200,000 each. They were spending more money without the protection. I also had to retrain Bell Labs. They only had 3 decent scientists left & no one knew the system protections anymore because they allowed the Netherlands to create picture books for installation instructions. Everyone who knew the Bell practices were all gone. It was sad. So they had me write down everything I knew & create a rule book guide for everyone to follow. Then all the other companies such as Sprint stole my designs. Which is why my last design for satellites & aerospace systems has never left my possession. They aren’t getting that one for free. Maybe I’ll give it to Space X instead of some DOD contractor, our govt or NASA stealing it from the patent office like Edison & Einstein did to Tesla. I watch technology end up in the trash for lack of proper specs while these neophyte scientists come up with ridiculous theories such as accretion conglomeration of our moon; while everyone who should know better applauds their absurd ideas. It is embarrassing. We are in such dire shape from splitting hairs that we have to use the Russian craft to resupply our ISS. They have an amazing laser docking system which we can’t replicate because we’ve replaced all our scientists & engineers with military & CIA to keep secrets instead of develop new technology. We should be very nice for the Russian favors since we have poor technology of our own. I share with you that same “feeling” that we’re living in deception and decadent times in regards to work quality, ethics, and moral values, cause all is about money, power and corruption. I’m just an economist but worked in financial markets as trader and analyst since my degree. I can tell you this, nowadays nothing makes sense, no fiscal or monetary policies right according to world structural needs; financial markets cycles are broken and rigged cause the “suspicious” massive central bank’s global intervention printing money like crazy into the financial system and this help can be “undone” now cause it’d be a catastrophe. The system is totally corrupted and it’s not working for humankind right evolution. All this makes me wonder, why all this are allowed? that’s why I watch all that weird events in our planet, something is going on but I still figuring it out. I agree. The corruption by our leaders is massive. But the generations are getting worse & cold about everything. Any hope of a Utopia society like Star Trek is gone. I listened to some of those programs who buy, fix & sell houses. They are all consumed with greed. Even those bridal shows are fraught with selfishness & greed. Not the spouse they plan to marry. Kids are running wild with no guidance. Education is terrible. I no longer have TV. Just DVD’s. But we have other ideas about Mars, the moon, our gov’t plans such as thinning out the population and other plans. I was with a major metro emergency management agency for 2 years as a member. I was sent by my employer because I was the only one who knew how to disconnect the entire metro area’s phones. Wireless & landline, etc. FEMA was there every meeting. It is very ugly. FEMA nearly beheaded me when I asked about supplies & rescues. They nearly beheaded the 911 manager as well for the same reason. They do not plan to rescue or save anyone. Better make your own plans & necessities. It would scare everyone if I told them the whole truth. Just remember Katrina. That was no accident. That is exactly how they plan to proceed. Round up & corral everyone into large arenas, some in FEMA prisons. No food, no water, no medicine, no necessities. Nothing for adults, children, babies, wounded. Makes no difference. Guarded by soldiers. Just held prisoner & corralled until they die. Then buried in mass graves, denied & forgotten while reducing the reported numbers of victims daily from tens of thousands or millions to a fraction. Thousands died at the New Orleans airport & were buried in mass graves but reduced to a couple thousand total. Katrina was a dry run of plans made in the mid 90’s. They will improve their mistakes learned. Next time, they wont allow media or medical volunteers or locals not in custody. The national guard or army will keep out all journalists, volunteers, rescuers, doctors, etc., like they did at Galveston keeping media in helicopters at preselected areas only. The media thinks they are being escorted. They are being controlled & kept away from sensitive areas. All info is planned & controlled. If you read the presidential exec orders, there are plans to use Mexican military if our soldiers balk from holding Americans prisoner. They will be told danger of contamination, bacteria, radiation or chemicals as excuse for imprisonment. That’s why those 2 helicopters from Florida were court martialed for Katrina rescues. Next time, there will be no media except where they script the scenes so the public will be kept in the dark. I thought they only planned this with terror attacks. Not Hurricanes. I was wrong. FEMA did exactly as they had stated at my meetings 8 years earlier. There are no plans to rescue or help anyone. FEMA steals all of the food, water, medicine & supplies for the gov’t shelters such as Colorado. FEMA doesn’t want any food or donations such as walmart tried to give Katrina victims. Remember how FEMA removed the parish transmit radio antenna to block outside communications? The parish sheriff had to place an armed guard to stop FEMA from cutting their contact & antennas to the outside world. This is no joke. FEMA confiscated satellite phones, hover boats, trucks of ice & everything donated by the public & Walmart. All the phones are disabled for the entire population. FEMA jams all communications & frequencies. This is in the presidential Executive orders for FEMA. Cutting phone service for everyone was supposed to be my job. Only I knew how. This was why Jeb refused FEMA help in Florida after Katrina. If a governor signs for Federal help, they are turning over full control & power of the entire state to FEMA. The governor is completely powerless. Fema has full gov’t authority & can conscript anyone into labor gangs or military. They are over everyone except the President. Read the executive orders. Just a few tidbits about FEMA. You have less than 1 hour to escape the area before all law enforcement are in place to block your escape. 30 minutes is better. Use back roads & get out of the area quickly. Use emergency supplies listed on Divulgence.net. They will go house to house & corral & imprison anyone left behind to be held prisoner by soldiers without food, water, medicine, beds, necessities until you die. You will disappear if you do. This is quite serious. Collect your own emergency supplies in advance and plan ahead. Do not ask for help. Remove your phone battery. You will be on your own. You may be safer in an army surplus uniform. Thanks for sharing your insightful opinion and experiences, no doubt that’s reality, sadly. I’m very aware that we’re our own in this phase. Fortunately, my soul is above of this Soap Opera, including religions, society, politics….our immortal hearts and consciousness will let us know at the right moment. I had to rewrite some of this comment. I use an OCR software to convert handwriting to text at sometimes it goes haywire & enters bizarre text instead of what I actually wrote. With those peripheral ice shelves gone, the land based glaciers will be able to slide into the ocean much faster now & that will affect the balance & axial tilt angle on a larger scale. I find it interesting that the name suomi is so similar to tsunami… because that is what we will see each time the planet shifts. When the axis angle reverted a couple years ago, just after we reached the tipping point, I had to wonder if our gov’ts were doing something to correct it. It is a long shot but the collider at Cern, for example, has multiple devices on multiple underground levels. It might be possible to correct the axis if they placed more than one of these combo devices around the globe which could interact to alter the axis tilt. Far fetched perhaps, but the collider at Cern is down for years at a time for supposed upgrades & repairs. A group of countries invested Billions of dollars but the collider only ran a couple days before it was shut down for years; more than once. Perhaps to run a large interacting planetary magnet system to correct the axis. This is grasping at straws but you should read about the Cern colliders many extended shut downs since the very beginning. I was shocked at the down times & few days of operation. Why would so many countries invest so much money for a collider which is repeatedly shut down for years? Especially small countries with little finances to spare. It would require multiple devices across the globe. The US likely built another one as perhaps China or Russia, to complete the global network. They never mention the purpose of other devices they built at different levels in Cern. So perhaps the collider is shut down while these other levels are in operation? Just a thought. Everyone should read about the many years of multiple shut downs of the Cern Collider. It might be of interest. I can’t think of anything else which could have reverted our axis at the tipping point. The axis angle still isn’t perfect but the axis angle did improve a couple years ago and stabilize. Someone asked me about the rotation with the planet on its side or upside down. We have a couple planets in our system which meet those criteria, and provide examples of what to expect. However, Earth does not have enough weight at the top to flip upside down like some other planets. If we did flip upside down, the rotation would be backwards became it would maintain its current rotation direction & the sun would rise in the west. The best Earth can do, is to shift over onto its side with the poles horizontal where our equator currently is located, once enough south pole ice has melted or floated away. Only the land based ice will make a difference in the anchor point balance which affects the angle of our axis. Our planet’s axis will shift until it passes the halfway tipping point & we end up sideways. We will continue to rotate while lying sideways except it will be vertical up and down instead of spinning sideways horizontally. Since the sun & our planet are round, the sky & sun will still look the same to us during the Spring & Fall seasons when we are sideways. The sun will still appear as if it is rising in the east but it will be directly over the equator as our planet rotates bottom to top from our new sideways orientation. The Sumner & Winter seasons will be quite different if Earth is tipped onto its side. However, since our planet points in one direction as we orbit the sun, the sun will appear directly over the north pole during the summer with 24 hour solar heat and direct overhead sun for 3 months at the north pole while having the south pole in total darkness & freezing cold 24 hours. Then in our north hemisphere winter, it will reverse direction/leaving the north pole in the dark for 3 months & the south pole in 24 hour heat & direct sunlight. In between, the spring & fall will have the sun over the equator so it will look normal during those 2 seasons. We will get the bizarre weather extremes twice per year. The closer we live to the equator, the better the climate will be during all 4 seasons. We can now understand why the advanced ancient civilizations were near the equator since the earth has done this 11 times in the past. Tsunamis are the indicators of planetary shifting. They are usually not from earthquakes despite what you’ve been told; although quakes accompany them due to the shifting disturbing the tectonic plates & molten core. It’s like walking with a huge bowl of water. The movement causes the water to slosh over the sides of the bowl. A tsunami effect. The magnetic field has nothing to do with this planetary axis shifting. However, the shape of the field will change as the molten core is disturbed by our shifting & positional changes. Similar to a rubber ball with liquid inside as you turn it. The axis shift is survivable, but the tsunamis will flood massive amounts of the continents. Much like the movie”2012″ with the arcs to survive a global flood. Once the water & tsunami’s settle down, then the survivors can find safety above 300 ft elevations where there is fresh water which hasn’t been contaminated. Water & food will be a big issue. Living near the coast & below 300 ft will be the death of Billions. This is how the central US and NV, UT, AZ, NM, TX, OK, etc., were formed. A past axis shift tsunami created a massive wall of water which covered the central & west US, Egypt, India, Australia, North Africa, etc., and left huge salt water pools behind which became Inland salt water lakes hundreds of feet deep; landlocked & trapped. It took hundreds of years for these areas to evaporate; leaving salt residue behind like Salt Lake City, Groom lake, etc. The water in these areas poisoned the soil with salt. Ruining it for crops & destroying fresh water sources & lakes. Animals dying. Salty lakes & rivers taking millenia to evaporate & cut through canyons. Leaving behind salt & sand & dead soil we still see today in the US west & central US, northern Mexico, Sahara desert, Egypt buried in the sand, Arabia, after the water drained away. Even a few months of salt water will poison the soil. Other places will be covered with salt water for eons. But just a few days with walls of tsunami salt water is enough to cover our coastal cities like the Egyptian pyramids & sphinx. Now we know what happened in these areas. The floods happened without warning like the Dec 2004 tsunami which killed over a quarter million people from Africa to SE Asia in a matter of minutes. But this time, those epic floods will include contaminants from our industry as the salt water poisons our soil & water supplies. This easily could have killed 70% of animal life on the planet without fresh water & food. On another calamity, the asteroid belt between Mars & Jupiter was once a planet with about 6 moons. Something destroyed it & our planets solar orbits shifted. Just a small shift in our orbit was enough to cause the great Ice age & instantly freeze animals with food in their mouths & humans & dinosaurs or mammoths. Or leave a boat on Mt Ararat. It also left Mars in a colder orbit with 2 asteroids orbiting like moons. I had always believed our moon Came from the pacific ring of fire when the planet was molten which we know because the moon is spherical as liquids are in space. Our moon is not an irregular conglomeration of impacts as they now claim. That would leave a debris field & a debris ring around Earth & the moon. But, if our moon came from elsewhere as some scientists claim, then it came from the asteroid belt where it once orbited the former destroyed 5th planet. The same way those irregular asteroid chunks found their way into the orbit of Mars. When that former 5th planet was destroyed, Earth & mars shifted toward the gap it left in the spacing of the orbital fields & gravity forces. One other thing is the stray asteroid mentioned by Boyd Bushman, the late engineer at Lockheed. Due to arrive in the latter 2030’s. Likely from the asteroid belt. I wonder what destroyed that original planet. Now we know where all of those crater impacts came from on our moon & Mars. From the catastrophe which caused the ice age & deaths of the dinosaurs & animal populations. We also know what caused the great floods as well. I’m sure those impacts from that destroyed planet debris really caused havoc on our axis & rotation & easily caused the great flood tsunamis as our planet shifted, flooded & instantly froze to create the great lakes, Niagara falls and those instantly frozen animals with food in their mouths. The axis shifts & floods may have occurred at different times in history than the instafreeze when we were shifted away from the sun after the former 5th planet was destroyed. It probably took a few years for the debris to hit us & the new moon to find us. The destroyed planet & axis shifts may have occurred while humans inhabited earth. Perhaps the great explosion of the 5th planet being destroyed looked like a new bright star in the sky when viewed 2000 years ago? Just some food for thought. I may rewrite & create a post for this. Could you, mmc7, or someone else who understands the changes that are taking place show the rest of us an image of the globe with the positions of the continents after the earth shifts onto its side? I’m in northeastern Oklahoma, but there are people from several continents who read your blog. I’m sure we would all like to know where we might end up, and which countries would then be on the equator and which would be at the north and south poles. Will the earth stop spinning temporarily when the final shift occurs? If so, for or how long, and will those facing the sun at that time roast and those away from the sun freeze? What happens to the oceans? Wouldn’t they rush onto the land? I’m just trying to understand the ramifications of what we seem to be heading towards. A picture of where things would end up after the shift would be very helpful. Thanks. An overload in the Central American Transmission System in Panama caused a power outage at 1 p.m. on Saturday in Costa Rica. It also partially affected power in Nicaragua, El Salvador, Honduras, Guatemala and Mexico, the Costa Rican Electricity Institute (ICE) reported. The Central American countries are interconnected by an electricity transmission line of 1,820 kilometers, which extends from Panama to Guatemala. A city in southwest Iran posted the country’s hottest temperature ever recorded Thursday afternoon, and may have tied the world record for the most extreme high temperature. Etienne Kapikian, a forecaster at French meteorological agency MeteoFrance, posted to Twitter that the city of Ahvaz soared to “53.7°C” (128.7 degrees Fahrenheit). Kapikian said the temperature is a “new absolute national record of reliable Iranian heat” and that it was the hottest temperature ever recorded in June over mainland Asia. Iran’s previous hottest temperature was 127.4. Position of Sun averages 2 degrees or more from that predicted by software. If I remember correctly, the UK should be too far north for the sun to appear north of you. I think Spain is at the same latitude as the US where the sun can be seen further north than it should be. We had no changes the past two years. It was stable at the same angle we saw it in 2006. This year it moved further north again but only by a couple degrees. So it is on the more again. If we could Compare annual south pole ice melt, we might be able to match it to the number of axis degrees shifted each year. Leroy Fletcher Prouty served as Chief of Special Operations for the Joint Chiefs of Staff under President John F. Kennedy. A former colonel in the United States Air Force, he retired from military service to become a bank executive. Actually oil & coal are both fossil fuels. Crude Oil is created from sea creatures and coal is created from forest peat & plant life. Fossil because the sources are dead life forms. Which is why there is a limited supply. Old used oil which has not been burned can be cleaned & reused such as car oil. So some of it can be renewed but it is still fossil fuel oil. Then there are oils made from grains, vegetables & fruits such as corn, canola, safflower, olives, soy into. And fish oils. So it is a broad subject. However, in my personal opinion, I don’t believe oil & coal were developed over millions of years of accumulation. I believe it was created all at once when the original 5th planet was destroyed & became the asteroid belt between Mars & Jupiter. The planets of earth & Mars shifted, killing all life forms at once, creating a massive pool of dead primitive animal sludge for oil & a dead peat layer for coal. Animal & plant life recovered but the moons and asteroid debris of that destroyed planet later affected our orbit again. Causing the ice age & instafreeze of mammals & dinosaurs. Some in mid meal of consuming their food. (not from an asteroid impact killing dinosaurs. That was just one occurrence from the destroyed planet debris. It was the sudden orbital shift of Earth which instantly killed the large mammals & dinosaurs. Leaving only those animals which could find shelter or burrows or near the equator.) & later the great flood occurred from the melting of the great ice age as we stabilized in orbit. It also shifted Mars as well. I had always believed our moon came from our pacific ring of fire region. But others claim our moon did not come from earth. It certainly was not a conglomeration of debris as they currently claim. The moon would have been irregular in shape & the Earth surrounded by a debris field or ring if that was the case. The fact that our moon is spherical shows it was molten or liquid when formed in space. If not formed from Earth, then it was a moon which used to orbit that former 5th planet which assumed Earth orbit after its own planet was destroyed. That former 5th planet probably had 4-6 moons which wandered in space or in the asteroid belt after the planet was destroyed. Eventually falling into other orbits. These things likely occurred over eons. Clearly, the two moons of Mars are asteroids from the destroyed 5th planet. Our moon has always been a moon for either earth or the original 5th planet which was destroyed. Here is just one of my comments from 8/24/2007 which predates Connors theory by 2 years & was posted on this site. I knew I had posted these statements before his theory. All of my ideas were my own original theories without any influence from other sites or sources. No one else was posting on the subject except me. Here is just one of my comments from 2007. I started this site devoted to the axis shift in 2006 and posted on Divulgence long before that. It is my opinion based on what has occurred thus far, that the earth’s axis will continue to slip from the imbalance of weight distribution as the ice melts. Earth is slightly larger and heavier at the equator, so I believe we may end up with the earth tipped on its side, once the polar ice has melted enough. I posted multiple comments about the south pole ice acting as a gyroscopic anchor & the earth shifting onto its side because there was insufficient weight for the planet to invert upside down. His theory is word for word from my comments posted on both this site & divulgence.net. I knew I could prove it. Temperature records have fallen as many Australians woke to freezing weather this morning. Snow, hail and rain has fallen across parts of Victoria, South Australia and Tasmania, as a band of cloud followed by a pocket of cold, dry air crosses the Tasman Sea. As forecast, Sydneysiders shivered through the city’s coldest pair of mornings since 2008, with minimum temperatures plummeting to 5.4 degrees today and 5.8 degrees yesterday. Goulbourn, the coldest city in New South Wale’s south-west, reached -10.4 degrees today, a Weatherzone spokeswoman told 9news.com.au. I seem to have missed some comments on here. Thank you for your all your replies . and advice as to the posting rules… I am a Tesla researcher, but did not now all the facts in such detail. I am not so sure I understand the implications of the coming pole shift, other than climate change. …floods, a coming ice age? In this time, certain types of activity, such as sunspots and solar flares will drop – but, it’s also expected to bring the development of long-lived phenomena including coronal holes. When solar minimum occurs, the upper atmosphere cools down, reducing the drag. And, NASA explains, this means space junk is more likely to linger. ‘During solar minimum, the sun’s magnetic field weakens and provides less shielding from these cosmic rays,’ Pesnell says. The sun is heading toward solar minimum now. Sunspot counts were relatively high in 2014, and now they are sliding toward a low point expected in 2019-2020. While intense activity such as sunspots and solar flares subside during solar minimum, that doesn’t mean the sun becomes dull. Solar activity simply changes form. The arrival of intense cold similar to the one that raged during the “Little Ice Age”, which froze the world during the 17th century and in the beginning of the 18th century, is expected in the years 2030—2040. These conclusions were presented by Professor V. Zharkova (Northumbria University) during the National Astronomy Meeting in Llandudno in Wales by the international group of scientists, which also includes Dr Helen Popova of the Skobeltsyn Institute of Nuclear Physics and of the Faculty of Physics of the Lomonosov Moscow State University, Professor Simon Shepherd of Bradford University and Dr Sergei Zharkov of Hull University. these streaming videos are dragging down the page loading. Limit the links to articles only. Or perhaps just one video if it contains extremely important info such as the Searle effect. I am concerned that you might get caught in the WordPress automated spam trap. The criteria specifies comments with more than 2 links will be auto tagged as spam which would block you from all WordPress sites. I would never know who was tagged. I have no control or access over their spam software. It is on all WordPress sites & automatically tags & removes comments which meet the criteria without any of our involvement. They don’t read the links. They only count them. They also target certain words. The link criteria doesn’t apply to the main posts because those are only submitted by site owners. Your info is wonderful. The non video articles are better such as the one I reposted from Huffington Post which you sent. Most people don’t watch videos but will read articles. So please do continue to share those wonderful articles . The sandy beach is littered with whale bones and ribs of old shipwrecks. A new island has emerged off North Carolina’s Cape Hatteras, with speed that has surprised observers and tourists alike. The Outer Banks are known for rapidly shifting sands, thanks to high-energy wind and waves. It appeared out of nowhere in April just off North Carolina’s Outer Banks—a new land mass poking through the surf, a brand new Atlantic Ocean island. We are now at a tilted angle of about 50 degrees instead of our original 23.5 degrees. 45 degrees is the halfway point of the distance of the angle. So we are already past the halfway tipping point. It wont take much more loss of Antarctic ice to shift our axis the rest of the way where Earth will suddenly slip completely onto its side where the equator is our next heaviest point. The planet will not invert upside down because there is not enough land or land-based ice at the north pole for a complete inversion and that is unfortunate. We would do much better upside down which would only reverse our seasons; as opposed to a horizontal shift. Our mismanagement of the planet has accelerated this to where we will probably witness this shift in the near future based on our annual measurements of the continuing axis shifts. In May 2, 2009, Connor Theory was published expressing concern for global melting. Perhaps you can comment on the Solar Minimum,/ in the following links / this due to the pole shifting ? / and the Sun going to sleep/ assuming there will be no ‘global warming’ in regard to your theory? : Modern Solar Grand Maximum Ends: ‘Little Ice Age’ Cooling Coming! That theory sounds suspiciously word for word what I’ve been saying since 2005. I also was the only one who said the planet would tip on its side while everyone else who later became aware of the shift said upside-down. I had to correct everyone on why it wasn’t possible to flip upside down. Not enough weight at the north pole. That publish date is 4 years after I posted those identical opinions. In reply to your sun question. The sun has an 11 year cycle of solar activity. Every 11 years it becomes very active with solar flares, CME’s, etc. I believe 2013 was the last active time period. The next would be 2024 if my memory is correct. It doesn’t mean that there are no flares or activity between those cycles. It just means there is higher activity every 11 years. Nor does our gov’t, NASA & NOAA tell us the truth. In June 2007, I saw 2 ion storms over Dallas about 2 days apart. Most people would not recognize an ion storm. This was in my area of expertise. This is also when the Intl space station experienced failure of all their primary & backup computers. The space shuttle just happened to show up a few days before the computer failures in time to off load the ISS crew & just happened to have a full set of computer component replacements on board. The ISS failure & the ion storms were clearly caused by intense solar flare activity but NASA & Space weather denied it. All evidence was removed from the records & they even tried to blame it on the Russian ISS systems 6 months later who were rightfully furious. Nothing from the ISS or Russians could have caused the ion storms which occurred at the very same times as the ISS failures. When I tried to get data & images of the ion storms, I was told by NASA, NOAA, NWS & a meteorological university that all lightning data was classified. Why would you classify lightning unless you were weaponizing it? I posted an article on this site about bizarre lightning occurrence I saw 2 or 3 years ago. The question is: Why did they lie about the solar activity which crashed the ISS computers & caused 2 ion storms in June 2007 which exactly corresponded with the timing of the ISS computer failures? This had to have been a massive solar flare & coronal ejection which hit our planet. Also, NASA had to know about this in advance in order to have the shuttle arrive at the ISS just prior to the solar event with a full set of replacement components for the ISS computers. Just in time to off load the crew from the ISS as all their systems begin to fail. Why are they lying about it? Probably to cover up the fact they failed to notify the public about extreme solar flare activity. Another cover up of events from the public like they do with everything else. All the public data has been altered by FEMA, NASA & the gov’t for every major event such as; Seismic activity, volcanic, tsunami, axis shifting, asteroids and severe solar activity as well as cataclysm death tolls are all kept from the public. NASA does the same. Even their employees are kept in the dark. CIA black ops inserted at JPL, MSSS, etc., alter & censor the images & data before NASA employees ever see them. Even SpaceX is sabotaged by black ops contractors for failure. That’s why we see so many launch pad & mission failures. The CIA wants to keep their foot on their neck. Of course spaceX & other space contractor companies are not aware of these black ops who sabotage their efforts & censor data. Some of the censored images & data hide the true conditions on Mars, the moon & ET activity. You can see it for yourself. The censors always miss things on the official imagery. The CIA needs to be scattered to the winds like JFK wanted before Allen Dulles orchestrated his death. As I said I have relatives who worked there and the CIA is as rotten as they come & ooze their control into every corner. A shadow gov’t. So when people ask why the gov’t would do such awful things & tell such lies, read about the CIA & their experiments on innocent humans & global assassinations. There is no limit to their corruption & control. Here is a 2007 article from Space.com which has so many overwhelming ads, I’m forced to paste the article on here so you can read it. HOUSTON — The loss of vital computers governing Russian systems aboard the International Space Station (ISS) has left the orbital laboratory dependent on U.S. gyroscopes and NASA’s visiting Atlantis shuttle, and may lengthen the orbiters already extended flight, mission managers said late Wednesday. The computers, which control the space stations Russian-built navigation and command and control systems, shut down early Wednesday as shuttle astronauts began retracting a solar array outside the ISS. For reasons that are unknown to us at this time, we lost both of those computers and currently were in that configuration, said Mike Suffredini, NASAs ISS program manager, during a briefing here at the space agency’s Johnson Space Center. The computer failures have left the station without the use of its Russian attitude control thrusters, Elektron oxygen generator and other support equipment, though the ISS has plenty of oxygen supplies and U.S.-built redundancy to make up for the loss for the time being, Suffredini said. The stations three-astronaut crew and seven visiting shuttle astronauts are not at risk, and have not lost all vital systems, he added. The lights, the fans and, thank God, the potty, all those things are working, Suffredini said. The ISS is currently relying on its four U.S. control moment gyroscopes to maintain its orientation in space, then shifting to thrusters aboard NASA’s shuttle Atlantis when the gyroscopes are overwhelmed, or saturated. That dependency is leading mission managers to discuss the possibility of extending Atlantis 13-day mission by a day or so and conserving its supplies where possible, Suffredini said. Atlantis mission was already extended two days to allow an added spacewalk and the repair of a torn shuttle blanket. In a worst-case scenario, in which the issue runs beyond current shuttle mission and exceeds the capabilities of the stations U.S. system ability to control the ISS, its three-astronaut crew could return to Earth. If we are in that position, we do have the option to depart, Suffredini said, stressing that he believes the computer issue will be solved in the next few days. I’m not thinking is something that we will not recover from. Computer issues The stations Russian segment has a network of six primary computers, three for guidance and navigation and three for command and control, any one of which can handle the duties of its counterparts, Suffredini said, adding that only two were online early Wednesday. While the computers have experienced hiccups in the past, a system-wide reboot typically solved the problem, mission managers said. Of course, what’s unique is that when the system went to reboot itself, it wasn’t able to do that, Suffredini said. The stations Russian segment has a network of six primary computers, three for guidance and navigation and three for command and control, any one of which can handle the duties of its counterparts, Suffredini said, adding that only two were online early Wednesday. While the computers have experienced hiccups in the past, a system-wide reboot typically solved the problem, mission managers said. Of course, what’s unique is that when the system went to reboot itself, it wasn’t able to do that, Suffredini said. On Tuesday, an unexplained glitch hung up the stations Russian navigation computers as astronauts deployed two starboard solar arrays from the end of the stations new Starboard 3/Starboard 4 (S3/S4) truss segments. The glitch kicked off a series of computer errors that included a false fire alarm that sent the ISS crew into emergency procedures for a brief time. ISS engineers are studying a number of possible explanations for the computer issues, ranging from electromagnetic interference to the added mass and power supply delivered in the new S3/S4 trusses and solar arrays, mission managers said. Russian flight controllers plan to dedicate much of Thursday morning, when the ISS flies over Russian ground stations, to working through the computer issues. Of primary concern for ISS flight controllers is the recovery of the Russian attitude control system, which orients the station using thrusters when the outposts U.S. gyroscopes are overwhelmed. The system, Suffredini said, is typically used just after a shuttle docks or undocks from the ISS to dampen out the change in momentum. It is also used to move the ISS out of the way of orbital debris, he added. Kelly Beck, NASA’s lead ISS flight controller for Atlantis STS-117 mission, said the stations Expedition 15 crew worked closely with Russian flight controllers to work through the computer glitch. Russian ISS flight controllers assured the stations Expedition 15 that everything was being done to root out the issue. Definitely, we are going to do everything possible to resolve it, Russia’s Mission Control told the ISS crew. I must have missed your comments when I was ill & in the hospital that weekend. The comments must have rolled over to a new page. This is a very complicated subject. I think it is very important for everyone to understand just how low our gov’t will go. It doesn’t end with just one administration. I have a fairly stellar photographic memory so you may wish you hadn’t asked. I will double check my documentaries and update if I misspoke on any details. Also, you did not specify which 911 event you are referring to. There were the 2 WTC’s, the plane that ended up in the field and the Pentagon. Then there was the anthrax in the mail. FEMA & the gov’t like to reduce numbers on death tolls & tsunamis & distances, etc. A game they play. For instance, if the planet shifted 800 miles, they will admit to the shift but will reduce 800 miles to 8 inches. It is their version of sugar coating while claiming they admitted the event took place. If we were talking about finding alien life on another planet, we would be referring to the greys while they would only admit to bacteria. This is a sample of how they think. When I was assigned to the Houston Emergency management 20 years ago, FEMA & Red cross bullied their way into taking over and stole all the money & supplies while implying they were keeping it safe. It was safe all right. We never saw it again. All the supplies ended up in their Denver shelter. None of it came from them in the first place. No one seemed to care but the 911 center manager & myself. When I asked about rescues & supplies, they nearly tore my head off. There were no plans to rescue or feed anyone. Only to block off the roads, corral & contain the victims in huge arenas without feeding or providing any necessities. I suspect they are trying to thin us out like the Georgia Guide stone. But I never thought they would do this in broad daylight to the victims of hurricanes and floods. The job they gave me was to shut down the phone service for everyone except FEMA & Red Cross during a disaster. Isolating everyone to just 911 access only. The 911 center capacity was 30,000 in a metro area of 10 million. Frankly, I probably would have cut off FEMA and RC instead and left the phone service activated for everyone else. It is a preprogrammed function. Every phone can be dropped in less than 5 minutes. Of course the phone offices don’t work too well with flood water either. Bottom line: They had no plans to help anyone. Just block the roads & round up the victims like cattle; place them in Convention centers under armed guard, let them starve & create a mass unmarked gravesite on inaccessible land such as airport property or Federal land, etc. They were dead serious. Everyone would have about 30 minutes to an hour to escape the road blocks and cordoned perimeter. Take the back roads and have predesignated meeting locations with your family or friends because you can’t depend on your phones or internet to work because they will isolate you as fast as they can type in the command from any remote access such as your phone. They even have contingencies should the national guardsmen balk at holding our citizens hostage to die. The Mexican Army has an Agreement with FEMA to send in their troops. You can find these rules and contingencies in the US Presidential Executive Orders. For instance, once a governor signs an emergency aid request, they lose their power as governor and FEMA controls the state, services, law enforcement, national guard, etc. They also have the authority to scramble all broadcast frequencies and cut off communications or to conscript people into the military or work gangs against their will. Red Cross is also considered as a gov’t entity. FEMA controls the military and National guard and are answerable to no one but the President. They outrank Congress, the courts and the VP during martial law or when a disaster has been declared. They are very dangerous. I told people about it. Not one person believed me that FEMA or Red Cross would do such things until Katrina. Everything I said came true. Victims were held by armed National guard in big arenas without food, meds, or necessities or functioning sewers. FEMA & Red Cross sat in Baton Rouge over 30 miles away & refused to feed or help anyone & said victims would have to come to them. But the victims in the large center were held captive. Even those who weren’t were not permitted to leave town. All of the access in and out of town was blocked by armed soldiers, preventing them from leaving. Nor would they allow them to use the 70 buses parked outside of town either.So how could anyone go to Baton Rouge where FEMA said they had to go for help, while held captive, without shoes or transport or the bare necessities. Keeping in mind there were babies, children, women, disabled, ill, injured, etc. They were dying in the hospitals, in the nursing homes, in their own homes, in the arenas & at the airport. When they tried to get food, water, diapers, shoes & meds from flooded stores which would have had to throw away the items anyway, they were called looters & shot at. The only people doing rescues were 2 military helicopter pilots from Florida who were court martialled when they returned to base after rescuing dozens of disabled from their roofs and homes. No one was allowed into the area to assist as was done in Houston because they couldn’t cordon off the area as well and because the local government kept their control of the situation. FEMA refused & turned away trucks of food, water and clothing from Walmart. Sent ice trucks driving in circles across country. Locked up the 9 hoverboats donated for rescues & several satellite phones. Everyone refused to rescue the dying in hospitals. No police, firefighters or volunteers were allowed into the area. Fema snuck into St Bernard Parish at 2AM and pulled down their radio antenna on the roof of their emergency office HQ to deliberately isolate them so they couldn’t get help or tell their story to media. The mayor & sheriff replaced the antenna & placed an armed guard with orders to shoot anyone who came near it again. The mayor’s own mother drown in the nursing home and the gov’t hirelings made a joke of him crying.No one was allowed in to help because the troops were busy blockading the town and holding victims prisoner instead of conducting search and rescues. They waited 3 weeks before conducting searches. Long enough for the sick, weak, elderly and disabled to die. Especially without medicines, food, water and hypothermia from being wet. Without phone service, someone in a wheelchair or on a cane or walker couldn’t call for help, go on the roof, escape the house or even climb the stairs in their condition. They would have been trapped and helpless. The ill were taken to the airport and laid on the cold hard floor. Doctors came in from out of state & were not allowed to tend to the patients. They were told to sweep the floor while people were dying all around for lack of care & medicine. When the entire county had enough and was ready to invade the area enmasse to rescue the victims from this abuse, TX gov Perry sent buses to get them out & into the Houston astrodome before the country imploded into a war zone to help them. As for the death toll, they started off with 10,000 dead. Each day they whittled the numbers down about 1000 per week lower until they reached a palatable number about10% of the real death toll. Those out of state doctors said they saw hundreds die in front of their eyes while FEMA claimed liability issues. Those numbers didn’t include the hospitals where they ran out of power and supplies trying to manually keep them alive for over two weeks. Then there were nursing homes where nearly all died in the water and the disabled at home who couldn’t escape the water, house or obtain meds or run their medical equipment such as oxygen, etc. Insulin has to be refrigerated. Pharmacies were flooded. The Katrina bodies were quickly buried in a mass grave not far from the airport. They transported the homeless to states all over the country so no one could compare notes about who and how many died. But that 10,000 death told was dropped below 2000. Now we can compare to 911. The World Trade Center death toll started at 50,000 dead. The guards were actually forcing people to go back to their offices in the elevators after coming down the stairs. As an engineer, there is no way those buildings came straight down, perfectly even pancaking without explosives. The building tops above the damage would have fallen over & broken off if the planes had caused significant structural support damage. The buildings were supported from enormous pile driven steel girders encasing the elevator shafts at the center of both buildings which were welded at each floor level. If anything, the top would have fallen over sideways and into the street below. Not pancaking straight down evenly. No plane or fire would be enough to damage those mammoth vertical pile driven girders and central support beams at every other floor I believe. In addition, the floors below the impact were not damaged so there was no reason they would collapse. The center beams & elevator shafts would not have fallen or collapsed for any reason without demolition explosives. The floors at each level were supported like square donuts, so even in the floors and outer facade collapsed, the central shafts and girders would still be standing. Those massive, pile driven, vertical steel beams welded together in the center of the building and likely the corners as well, with support beams on alternating floors could not pancake vertically because they were pile driven vertically and would have to be disassembled by welds or explosives to allow the girders to break at each splice; regardless of the plane impacts. Those buildings were specifically built to withstand plane impacts. Nor would building 7 collapse when it wasn’t even hit. Marvin Bush (GW’s brother) had his security, company working in both towers two weeks before 911.They had the bomb sniffing dogs removed during those 2 weeks they were working there and did not restore them to duty when the left. The bank manager was doing a software upgrade over the weekend at night & heard them drilling concrete on each floor near the central elevator shaft. The maintenance man said he also heard drilling in the basement. The bank manager also heard scraping noises above him so he went up a floor & found AEC? (insurance Company?) had moved out all their furniture during the night & emptied their offices. Marvin Bush’s company finished their job on 9-10. Who finishes a job on a Monday? The bank manager was fortunate to have stayed home on Tuesday 911 because of his weekend and night work. Their WTC death toll started at 50,000. In typical manner, they reduced the numbers each week claiming duplications until they got the numbers dropped below 10%. Below 3000. Low enough for people to be satisfied it was reasonable and fortunate. It is a psychological game the gov’t plays to disarm the public. Since they allowed the buildings to burn to ash, the remains were quickly & easily transported with the building debris to a foreign county where it was immediately sold. This didn’t set well with the firefighters who lost over 350 members. Isn’t it amazing how a pristine passport of a perpetrator was discovered. As for the 911 plane which crashed in a field, the crash spot was mighty barren to have held a plane full of passengers. It was nothing but a gash with a small handful of pieces sprinkled over it. Planes consist of massive numbers of parts. The engines alone are huge heavy titanium metals. Not to mention the cables and wires, seating, luggage cargo, fuel tanks, wings, fuselage. The wings usually break off in large pieces. None of that was seen there. The Pentagon was another case of trickery. Only that side of the building had been reinforced & renovated. Just a day before had they begun moving people into those offices. Ironically, just like the Paris tunnel on the night Diana died, the cameras were out just during those crucial minutes. All of the cameras were either down or missed the impact. It made a round hole with no marks around the entry where wings & engines should have hit the wall as the fuselage penetrated. The wings should have broken off and laying on the ground in front of the holes. Additionally, the hole was so low a plane would have hit the dirt, broken apart and ended up flattened & crumbled against the wall. Not to create a round hole like a spear. Yet again, only ash and a small piece of engine the size of a dinner plate was found. No crew, no plane cowling, entire engines, wings, fuselage & all that Cockpit wiring, seats, luggage & people vanished (except for a few parts sprinkled at each site. The hole was horizontal and low to the ground & impossible for a plane to approach from that angle. That was a missile painted to look like the plane. No wings (perhaps small missile stabilizers), no people except those in the building before the impact and whatever they added to it. Even Rumsfeld slipped & referred to it as a missile that day. There is so much more I could write a book. No plane came in that building at that height & angle without leaving wing and imprints around the entry point and broken off on the ground outside. Trained military smelled cordite. This was the worst scam of all time since the Kennedys & he got away with it. The so called terrorist was said to be on a religious jihad yet he was seen in strip joints in Florida, eating forbidden food & drinking. Doesn’t sound like a religious vendetta to me. He was also identified as a CIA asset. The female FBI agent who reported their suspicious behavior and flight training to her boss was transferred to AZ (I think). Another Wash DC agent who reported suspicious info about them was transferred to the WTC a few days earlier but decided to take the day off & survived. Clearly, they were trying to get rid of him. The anthrax was traced to Ft Dietrich army biowarfare lab about 30 miles north of WDC where the Sec of defense was also a Pharmaceutical CEO & easy access & knowledge to obtain the bacteria. They made a scapegoat out of the poor lab director because he would have known exactly who had scanned their ID for lab entry. This is how they discredit people from blowing the whistle by making them a fugitive. Remember the ridiculous pond draining? It was like Alger Hiss and the pumpkin patch all over again. Finally, the poor guy got a great job at Rice University and the gov’t threatened to pull their grant monies if they didn’t fire him. Blackmail. So they had no choice but to fire him. He must have expressed his disdain over their abuse of dangerous bacteria in the mail. That anthrax was said to have been accidentally weaponized by mixing it with water and left to dry which made it aerosolized with the air and easy to spread and inhale which is why it was spread so easily in the postal sorting equipment. It was mailed in letters clearly written by a native American based on the way it was addressed and written. It was only mailed to the top 3 democrats (the biggest thorns in W’s side) when republicans were in power. A real terrorist would have gone after the party in power and would not have known American abbreviations in addresses. Of the two media targeted, the one in Florida who published Enquirer type newspapers had exposed W’s cocaine abuse when he was in the National Guard and college (published during his presidential campaign and was the first to get the anthrax and the first to die). The other was Brokaw at NBC because he had expressed great offense at the Florida elections tampering and Gore’s stolen presidency. The Florida ballot results were counted by W’s campaign manager who was head of elections & the same state where the governor was his brother. Talk about conflict of interest. My generation took down Nixon & stopped a war. W got off scott free & gave out billions in bailouts to foreign companies who didn’t need it just before he left office. However, our predecessor generation let the CIA, LBJ, Allen Dulles, Nixon & Hunt get away with killing JFK; RFK, MLK, Oswald, the VN president & many others. Then Dulles Ford, Spectre & Bush Sr used the Warren Commission to cover it up and this was before Watergate, Cambodia, Ellsberg Breaking & entering & extortion payoffs & pardons. Someone needs to clean house. Now we have Russia doing our voting. I’ll have to check and make sure I got all the details right. They still aren’t listening because they are still blaming it on northern ice, etc. They don’t understand how planetary balance works. It took them 10 years just to admit the axis shifted & then they tried to take credit for the discovery.